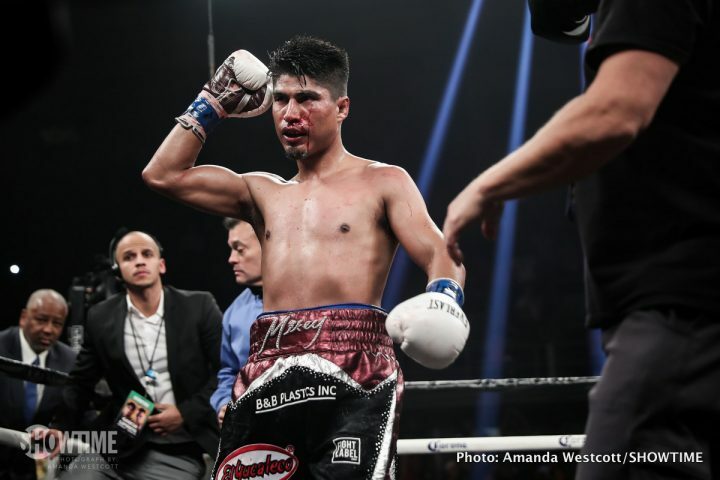 By Dan Ambrose: Mikey Garcia says he wants to take on IBF welterweight champion Errol ‘The Truth’ Spence Jr. in December. Three division world champion Garcia (38-0, 30 KOs) says the main reason he wants to fight the 28-year-old Spence is because people don’t believe he’ll do it. Mikey has enough talent to compete against some of the welterweights, but probably not against a guy like Spence. He’s too big and strong for Mikey The type of guys That Mikey could possibly do well against are the fringe contenders Devon Alexander, Yordenis Ugas, Amir Khan, Rashidi Ellis and Carlos Adames. Putting together a fight between Garcia and Spence will be a simple thing to do, as both guys are with Al Haymon. This isn’t a fight between Mikey and one of Top Rank’s fighters. If Mikey truly wants to fight Spence, then it’s a fight that can get made. Spence says he’s interested in fighting Mikey. Garcia, 30, moved up to light welterweight last year and defeated Adrien ‘The Problem’ Broner and IBF 140 lb. champion Sergey Lipinets. Garcia performed well in beating Broner by a one-sided 12 round unanimous decision. However, earlier this year, Garcia had a hard time in defeating Lipinets by a 12 round unanimous decision. The judges’ scores – 116-111, 117-110 and 117-110 – were out of out of bounds for the fight that had taken place. If anything, Garcia deserved a close win and not a one-sided 12 round decision. The results of that fight showed that Garcia is not going to do well if/when he move up to welterweight to challenge Spence or any of the top fighters. It’s not just Spence that will give Garcia a lot of problems. Danny Garcia, Shawn Porter, Lucas Matthysse, Manny Pacquiao, Jeff Horn and Terence Crawford would be a real handful for Mikey if he decides to move up one more division to face one of the top guys in the division. There are a lot of boxing fans who would love to see Mikey challenge Spence in 2018. If Mikey can’t fight WBA lightweight champion Vasyl Lomachenko in 2018 due to his promoters at Top Rank wanting to keep him in an in house fight against WBO lightweight champion Raymundo Beltran, then he might a well move up to 147 to challenge Spence for his IBF title. The 5’9” Spence’s size and punching power will likely win him the fight against the 5’6” Mikey. It would be a really tough for Mikey. I think he could get very hurt if he tried to win the fight. If the idea is for Mikey to face Spence to get a big payday, and then bow out in between rounds after the 3rd or 4th, then it’s understandable why he’d want to fight him. It would be a real letdown for the boxing fans if Mikey is just name dropping Spence’s name in order to gain attention from the fans. he does. He lacks the reach and the legs to run from Spence for 12 rounds. It’s not going to happen. Mikey will be fighting IBF light welterweight champion Robert Easter Jr. (21-0, 14 KOs) on July 28 in a unification fight on Showtime Championship Boxing at the Staples Center in Los Angeles, California. After that fight, where does Mikey go? Does he go after one of the dangerous light welterweights like Regis Prograis or does he move up to welterweight to take on Spence like he says. This would be a real show of bravery on Mikey’s part if he were to take on Spence because it’s such a crazy match-up. Mikey’s fight against Lipinets showed clearly that he doesn’t have the size, power, speed or talent to compete against a top welterweight like Spence. The Garcia-Lipinets fight was far too close for Mikey to move forward to take on a good fighter from the welterweight division like Spence. It would be a long shot for Garcia to beat Spence if the fight did take place. Garcia would be a major underdog in the fight. Even if he loses by a lopsided decision, he would come out ahead in the eyes of a lot of fans. No one would see Garcia as having a chance against Spence, because he’s a very big welterweight, who should be fighting in the 154lb weight class. Garcia knows that he wouldn’t stand a chance. It would be a very bad fight for Mikey if he ends up losing the way that Carlos Ocampo did in getting knocked out in the 1st round. Spence won’t be afraid of Mikey’s power because he can’t punch even at 140. His power won’t travel up two weight classes to fight at welterweight against the 170+ pound Spence in December. As far as Mikey fighting Lomachenko or Terence Crawford, I don’t think Mikey ever wants to fight a Top Rank fighter after his promotional problems that he had in leaving the company. Mikey would show a lot of courage if he took on Spence, but I don’t think he plans on ever doing it because it’s so risky. Mikey has been name dropping Spence’s name since his fight against Lipinets last March. Mikey has received more attention telling boxing fans that he’s interested in fighting Spence than the attention he’s received in beating Lipinets and Broner. If Mikey’s idea of to just gain attention the cheap way calling out Spence with no real idea of fighting him, then it’s pretty sad. Mikey is better than that.